my Raya this year. | escaped. If there was ever a different, better, over-the-moon-happiness I ever felt for Raya in my entire life, this year's would be it. Of course, some things just never changed; but the beauty of the emerging the two worlds between immaturity and stepping into the adulthood is simply breathtaking. I drove all the way to Penang for the first time, I bought only ONE baju for Raya for the first time, I bought kuih raya for home so that Mum could spend her money somewhere else she really wants, I brought my little brother beraya with me and my friends for the first time (he's lone ranger like that lol), I FREAKING TAUGHT HIM HOW TO DRIVE, I drove all the way back from Penang to Bangi for the first time! And I brought Mum along to let her see the town I've been living in for the past 8 months. Tell me how that's no maturity HAHA. But jokes aside, really, Alhamdulillah. 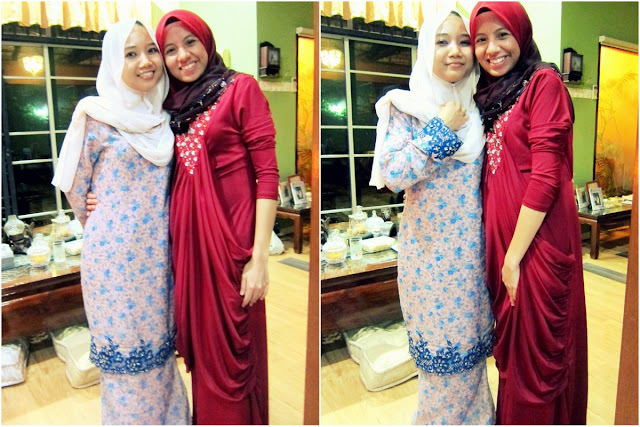 And our Raya ritual, beraya at Farah's house. Couldn't be happier to see Syena who's expecting her first child sometime next year. Gosh, how do you act when you see your bestfriend who's pregnant for the first time?! I kept touching her belly and asked, "do you feel anything??" Moving on from obsessing with her belly, I diverted my attention to Farah's new cat, latest addition to the clan. This was a few days after Raya, so please excuse the eyebags. Sister made me help her with her wedding preparations till midnight and I gladly said yes; obviously under a heavy influence of super sweet kuih raya and delish ketupat. Over the years, I realize the important things that made me human again - and it's true, finding yourself through Ramadan is the most beautiful thing and feeling, ever. I never thought I'd experience those feelings; being the non-perfect Muslim that I am, just to feel thankful to God is serene enough for me. InsyaAllah, the next Ramadan and Raya will be better for us.